The Book of Possibilities is a distillation of over twelve years' experience of meditative practice and group process by the Flying Squad (Earthlinks Circle). It's a sort of manual for this kind of world work. It is written by seven members of the group, with material drawn from experiences encountered and methods evolved over the years. The book is written for people who are becoming aware of the power of consciousness in shaping their experience and affecting wider world issues and events. Part handbook, part wisdom that has come up while the group is in session, it is a guide to the meditative techniques and consciousness experiments used by the Flying Squad. It will help those of you who are interested in psycho-spiritual work to support world transformation, conflict-resolution and global healing. The book is rich in examples of the work in action, laying out clear guidelines for undertaking these practices in any group dedicated to a similar purpose. 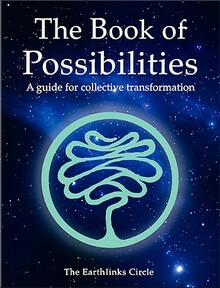 The Book of Possibilities can be ordered through good bookshops and online through Amazon. The Book of Possibilities, by the Earthlinks Circle. ISBN: 978-1-907084-20-1. 262pp. 190x245mm. Order here. We have reached a critical point in human development. Our planet struggles and humans are confronted globally by deep-seated conflicts and destructive patterns of behaviour. Driven by short-term self-interest, many modern people have lost touch with a sense of connection with the web of life. At the same time, developments in the fields of science, consciousness and spirituality suggest that we are on the verge of a quantum step change in our understanding of the nature of the universe and of the place of consciousness within it. Humanity has reached a point where it is both possible and required that it takes a proactive and intelligent part in shaping its own evolution. This book assists in that process. It goes beyond self-help, demonstrating that our capacity to change how we individually and collectively experience life is greatly enhanced through working consciously, in groups, for the highest good of all beings. It enables us to instigate a collective choice for the exercise of this capacity to become our reality. The book draws on current experience, ancient mystical traditions and newly received psycho-spiritual approaches. It offers guidelines and tools, laid out in a way that is easily accessible to all.